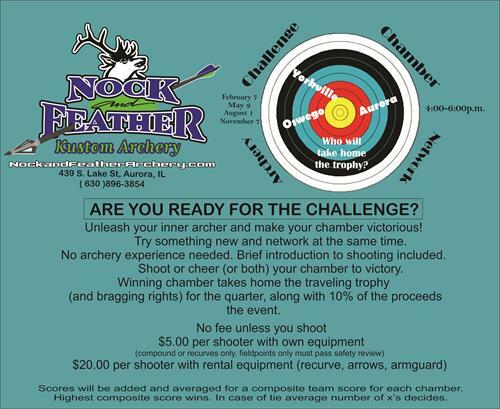 Event Description Join members from the Aurora, Oswego and Yorkville Chambers of Commerce once a quarter for a night of networking and friendly archery competition. Come to one or come to all. All are welcome, no experience needed, coaches are available to help you during the event. Call 630-896-3854 for more information. Winning chamber gets a traveling trophy for the quarter, and 10% of the proceeds from the shoot (did I say bragging rights?). Winning chamber will be determined by a composite score. Total points of the chamber/number of shooters for the chamber. If you belong to multiple chambers you must select the chamber you will be representing at the beginning of the night. Equipment rental available. Date/Time Information Februrary 7th 4-6p.m.